A dedicated and motivated team of Neonatologists, Pediatricians and intensive care nurses provides round the clock surveillance. 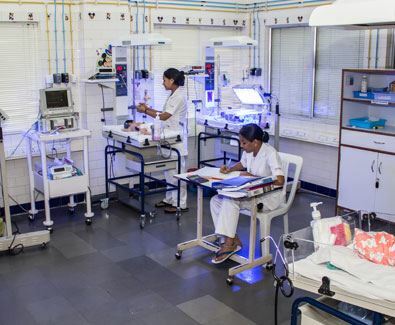 The Neonatal intensive care unit (NICU) has facilities to care for the sick and premature newborn. Along with the intensive facilities required to care for the ill newborn, Kangaroo Mother Care (skin to skin contact), a low cost concept for preterm care in stable babies is encouraged. In Kangaroo Mother Care, once the preterm or the low birth weight baby is stable, the baby is given the skin to skin contact by the mother, like the kangaroo keeps the baby in the pouch till it grows. There is a programme for problem neonates requiring extra care and long-term follow up. This involves a Paediatric Surgeon, Anaesthetist, Paediatric Cardiologist, Ophthalmologist, Orthopaedic Surgeon, Physiotherapist, Audiologist, Plastic Surgeon, Endocrinologist, Dermatologist and Neuro Surgeon.